After first launching in Hossegor in 2017, JO&JOE opened its doors on April 6, 2019 just a stone’s throw from the Cité Internationale Universitaire, in the south of Paris. This is the new place to be! EATING: A restaurant that seats 140, a varied menu of fresh, simple and generous dishes offered throughout the day. Dishes for sharing, like the XXL quiche and ultra-indulgent burgers. The cashless payment system lets customers pay with their mobile – it’s as easy as that! DRINKING: The bartenders are always available to welcome customers for a coffee or a colorful cocktail. HAVING A BLAST: A full line-up on offer each day with gigs, yoga classes, open mike events, DJ sets, etc. Stay tuned, the full line-up is coming soon on www.joandjoe.com! SLEEPING: Oh yes - JO&JOE is not only a friendly and welcoming living space where socializing, unique experiences and fun combine – it is also an Open House where you can sleep in a private or shared room, for one night or more! From €25 per bed. To celebrate the opening, the loooongest house-warming in Paris! To celebrate its arrival in the capital, JO&JOE is organizing the longest house-warming party for its neighbors in Paris and Gentilly! From April 24 to June 6, original and quirky events will be setting the pace at the Paris Gentilly Open House. Gigs, a comedy club and an illusion show are just some of the must-attend events open to all! Limited availability. First come, first served! Opening soon in other major world cities! JO&JOE aims to expand at international level. JO&JOE aims to expand at international level. Over the next few years, the brand is going to set up home in the biggest cities in the world, in the most vibrant areas, very close to public transport and within easy reach of the main points of interest. By 2020, JO&JOE will have launched Open Houses in London, Budapest, Glasgow, Paris (Nation district), Rio de Janeiro and Rome. London: Built in 1913, this building in the Shoreditch neighborhood was a musical entertainment venue. In the late 1930s, the building became a cinema before being turned into a large bingo hall. The London Open House will feature almost 400 beds. Budapest: located in one of the city’s most happening districts, the Open House will be on Klauzal Street, close to fashionable bars, restaurants and stores and will be served by 4 metro stations. It will also feature almost 400 beds, as well as an outdoor patio, meeting room and rooftop terrace! Glasgow: Situated on Sauchiehall Street, JO&JOE will be a 2-minute walk from the city center, 8 minutes from Blythswood Street station and a 30-minute train ride from Glasgow Airport. The Open House will include 400 beds, as well as a meeting room and terrace. Paris Nation: in the heart of this young and vibrant Parisian neighborhood, this 1,465m² project will feature more than 160 beds. 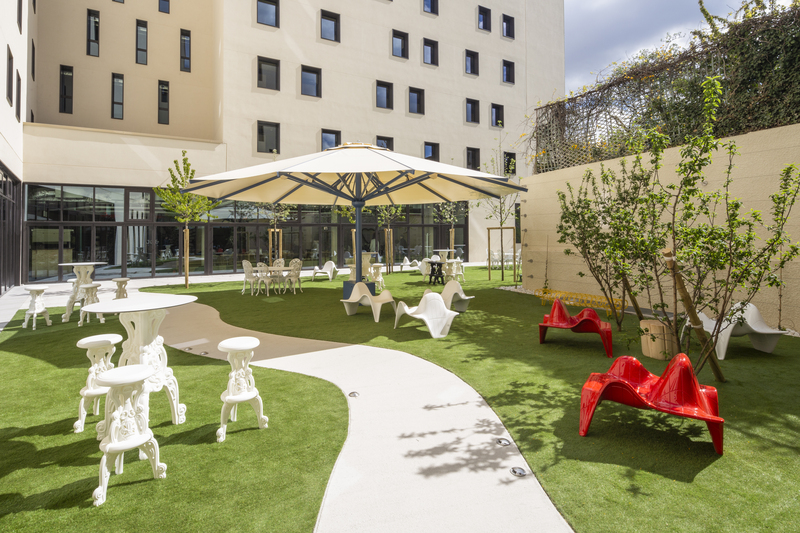 Open to the public, a rooftop area spanning 110m² will be the place for Open House residents to meet and chat with Parisians in search of a new and lively venue, in a welcoming and relaxed atmosphere. Rio de Janeiro: located at the foot of the Corcovado – the mountain from which the statue of Christ the Redeemer rises – within the “Largo do Botícario” architectural complex in the Cosme Velho district, JO&JOE will open its doors to become the coolest lifestyle venue in the city. The Open House will feature more than 300 beds, two swimming pools, a bar and a restaurant seating more than 200. Accor’s Lifestyle Division includes the brands JO&JOE, Mama Shelter, 25hours, sbe and TRIBE. “It is a response born out of the finding that travelers today are increasingly sensitive to distinctive brands, with strong identities, which are simultaneously working environments for urban nomads and places for the local community and travelers to socialize and enjoy experiences”, said Cédric Gobilliard, Senior VP Lifestyle Division Accor. The Group has decided to expand its offering in lifestyle, one of the most dynamic segments in the industry, with brands that focus on F&B, common areas and events. Launched to meet the expectations of Millennials and anyone who embraces their attitude to sharing, spontaneity and experience, JO&JOE has joined the Accor’s Lifestyle division and is the latest addition to the Group’s portfolio of Economy brands. This new hybrid hospitality concept is at the meeting point between youth hostels and traditional hotels. JO&JOE welcomes everyone in its engaging and vibrant Open Houses, offering a completely fresh experience in terms of design, dining options, service and customer experience. Following Hossegor, France, in 2017 and Paris Gentilly in 2019, JO&JOE’s vision is to expand into European and global capitals and other major cities. Next on the list are Paris Nation, Budapest, Glasgow, London, Rome and Rio de Janeiro.